The first game of the World Series didn’t exactly follow the script. The battle of aces never materialized. James Shields was completely ineffective, yielding five runs on seven hits in three plus innings. Waiting 10 days between games probably didn’t help Shields, but he has rarely looked like an ace come playoff time. When the Giants scored three runs in the top of the first inning, that sucked a lot of energy out of the crowd. Even though the Royals have been masters of late-inning magic this month, it seemed like a longshot that they’d be able to best Madison Bumgarner after giving him a lead. The Royals had their chances. Nori Aoki and Eric Hosmer managed some hard-hit outs in the bottom of the first. And in the third, Kansas City put runners on second and third with no one out. 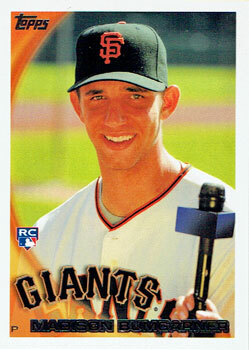 Unlike “Big Game James,” Bumgarner was able to shut down his opponent. The Royals didn’t score until the seventh inning when Salvador Perez hit a two-out solo home run. By that point, Shields and Danny Duffy had combined to allow the Giants to score seven runs. Maybe it was a moral victory – it was the first run Bumgarner had allowed in a World Series game, snapping a streak of 21 scoreless innings. Only Hall of Famer Christie Mathewson had a longer World Series scoreless streak at the start of his career. It was also the first run Bumgarner allowed in a major league record 32 2/3 playoff road innings. Maybe the close, competitive series that most of us were expecting will materialize later tonight. On Tuesday, the Royals looked overmatched.